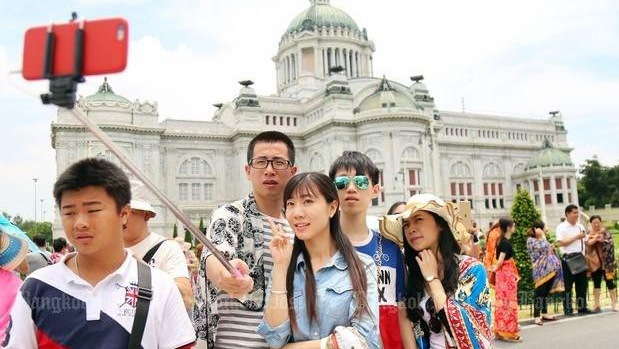 BANGKOK: The number of Chinese tourists visiting Thailand during this quarter is expected to continue dropping, say research houses. It remains uncertain whether the government can reverse the slowdown in visitors from China during the peak travel season from October through to the end of the first quarter, said Standard Chartered Bank Thai economist Tim Leelahaphan. Arrivals from China, which account for 30% of the total, fell 12% in August. They grew only 3% during China’s Golden Week holiday, less than expected, reported the Tourism and Sports Ministry. “We believe measures such as granting tourists from China double-entry visas or waiving visa fees would help to revive growth in arrivals, along with improved safety standards,” he said. Such measures have not been forthcoming from the authorities. In addition, fluctuations in the yuan may be deterring travel to Thailand. On the positive end, the ratio of independent Chinese tourists to tour groups has risen to 7:3 this year from 6:4 last year, according to the ministry. This is a positive indicator, as individual travellers usually spend more than those travelling in groups, said Mr Tim. Thailand received 26 million international tourists overall from January-August 2018, up 10% year-on-year, on track to reach the government’s target of 38 million this year. Kasikorn Research Center (K-Research), a research unit of Kasikornbank, forecasts that the number of Chinese arrivals to Thailand will continue to decline this quarter, but at a slower pace than the previous quarter. The estimate is based on the number of Chinese visitors, which rose 2.8% year-on-year, during China’s Golden Week (Oct 1 to 7). The report of higher numbers of Chinese tourists is echoed by Ctrip, which said Thailand remains the top global destination for Chinese tourists during the week-long holiday. The research house projects 10.6mn Chinese travellers will visit Thailand this year. Foreign visitors during the July-to-September quarter were estimated to grow by 2.7% on year, down from 15.4% and 9.1% growth in the first and the second quarter, respectively, to 9.01mn. The slower growth could be attributed largely to the decline in Chinese and Russian tourists. 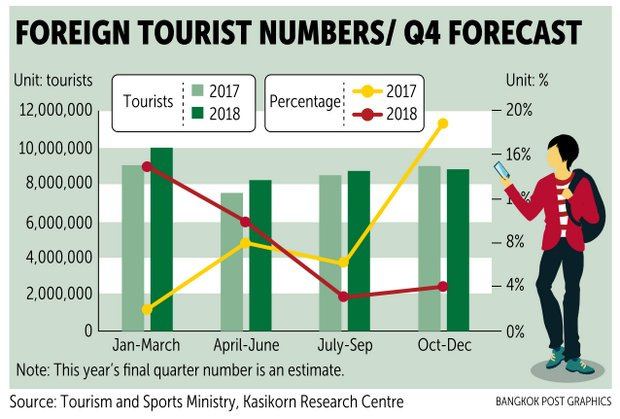 Even though K-Research remains pessimistic on the number of Chinese tourists, the house forecasts overall foreign travellers in the final quarter this year, which is the peak tourist season in Thailand, will rise by 3% from a year earlier to 9.56mn, supported by a recovery in Malaysian travellers. Devaluate the Baht and clean up the tourist destinations and western tourists will come back. In China people are waiting for 'salvage' of the Phoenix. By now,  just 3.5 months talk about it, + with lost of 1 thai salvage worker life is not very promising in restoring the Chinese confidence in thai maritime matters, sailing or salvage. Thailand seems not to realize that. Over de border thinking is not thai strongest point. Besides sleeping Van drivers, and busses without brakes. This is excellent news, long may the decline continue.